"Non-believers walk the sacred ground. Purge the heretics, so they not foul the air of Paradise. The time has come to enter the Great Light. The Promethean awakening is nigh, our reward is at hand." The Battle of Requiem was a series of skirmishes on the Forerunner shield world Requiem beginning on July 21, 2557. It was waged between the Prometheans occupying Requiem, Jul 'Mdama's Covenant forces and the United Nations Space Command. Shortly after the beginning of the battle, the Prometheans and 'Mdama's Covenant would join forces against humanity. These events marked the continuation of an ongoing conflict with Jul 'Mdama's Covenant and the UNSC, and the days following would see the conflict spread to Ivanoff Station orbiting Installation 03, and the human homeworld, Earth. Requiem would again become a battleground over six months after the initial battle in February 2558 when the UNSC launched a lightning-strike expedition to the surface of Requiem. "Requiem's treasures shall be ours." In December 2552, the aft half of the UNSC Forward Unto Dawn, carrying Spartan John-117 and AI Cortana, was transported via slipspace on a course toward Requiem after the last battle of the Human-Covenant War. Cortana activated Forward Unto Dawn's emergency locator beacon while the Spartan entered cryostasis. Within the next year, Jul 'Mdama led his forces, a partly reunited offshoot of the Covenant, to Requiem in search of the shield world's "treasure": he sought the Didact, the leader of the Forerunner military, due to their mutual hatred of humanity. However, 'Mdama could not find a way into Requiem, so the fleet held station in orbit. On July 21, 2557, the Dawn entered the planet's gravity well; 'Mdama sent his forces to board the frigate to keep any humans away. As Covenant troops entered the ship, Requiem began to scan the Dawn for a "Reclaimer". "If you haven't mastered even these primitives, then Man has not attained the Mantle. Your ascendance may yet be prevented. Time was your ally, human. But now it has abandoned you. The Forerunners... have returned." Cortana awoke John-117 from cryostasis and informed him of intruders on the Forward Unto Dawn. When the duo found out that there was a former Covenant fleet around the Dawn and one of the CRS-class light cruisers was moving into a intercept course, Cortana instructed John to fire one of Dawn's missiles at the cruiser. The Spartan battled through the wreckage and managed to destroy the cruiser moments before it fired its energy projector. While on the outer hull, John was scanned by a beam coming from Requiem, which then opened its interior for the Reclaimer. Forward Unto Dawn, along with several Covenant cruisers, was pulled into Requiem's interior. At least one cruiser was destroyed when a piece of wreckage from the Dawn impacted upon it as they were drawn into the shield world. John-117 and Cortana survived the fall into Requiem's middle shell. They decided to hijack one of the surviving Covenant ships to return to Earth, where they would be able to find Dr. Catherine Halsey to assess Cortana's rampancy. However, UNSC Infinity had picked up Forward Unto Dawn's distress beacon and was approaching the shield world. While looking for a way to contact Infinity, John and Cortana accidentally triggered Requiem's guardians, the Prometheans. The Prometheans attacked the Spartan as well as Jul's Covenant. In an effort the warn Infinity of Requiem's gravity well, the Spartan-AI team disabled two energy pylons inside Requiem's core in order to eliminate interference emitted from a satellite in the core. When John attempted to contact Infinity in the satellite, it was revealed that the Didact had purposely manipulated Infinity's signal to trick John-117 into releasing him from his Cryptum. The Didact openly declared war on humanity and resumed control of his mechanized Prometheans; viewing the Didact as a living god, the Covenant forces followed suit. John escaped Requiem's core just as Infinity entered Requiem's outer shell. "FLEETCOM, this is Infinity! We are encountering an unidentifiable gravimetric disturbance and are being pulled inside a planet of Forerunner origin! Possible contact with the UNSC Forward Unto Dawn!" — Andrew Del Rio broadcasting an emergency transmission. Infinity crashed into a jungle inside Requiem and was immediately attacked by Promethean and Covenant forces. During the attack, Infinity's commanding officer, Captain Andrew Del Rio, deployed Marines and SPARTAN-IVs for reconnaissance, believing that the Infinity would be able to fend off her attackers while providing support for ground forces. The ill-prepared Marines were overwhelmed by the unfamiliar Prometheans and suffered heavy casualties. In addition to losing their landing zones, many Pelican dropships were shot down. Infinity was eventually boarded, allowing the Didact to extract information about the Composer, a Forerunner superweapon, from the ship's mainframe. John-117 joined Commanders Thomas Lasky and Sarah Palmer just as Captain Del Rio recalled ground forces to Infinity. John cleared a landing zone for the UNSC forces and headed to Infinity's crash site. There, John-117 and a squad of SPARTAN-IVs broke through to one of Infinity's hangar bays. 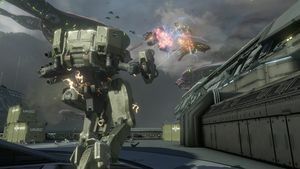 John piloted a Mantis assault mech and fought through Infinity's maintenance corridors to some of the ship's weapon systems. After John destroyed the Covenant jammers near the control terminals, Infinity disabled two CRS-class light cruisers and damaged the Didact's Cryptum, prompting the Forerunner to retreat. The repaired Infinity left her crash site, but since she was still under the effect of the Requiem's gravity well, Captain Del Rio sent John-117 and Gypsy Company to take down the Forerunner anti-air particle cannons near the gravity well generator. "Priority is to free Infinity from Requiem's gravity well and file a threat assessment back at FLEETCOM." Gypsy Company, aboard a Mammoth and led by Commander Lasky, destroyed the first and second anti-air particle cannons. However, a Covenant Lich heavily damaged the Mammoth. Even though John-117 and a SPARTAN-IV team destroyed the Lich, the Mammoth was forced to stop when it approached a Forerunner structure. John entered the structure and, with Cortana's help, disabled the last two anti-air cannons. Cortana suddenly disappeared, so John searched the structure for her. He was taken to an archived personality of the Librarian, the Didact's wife and the one who saved humanity from the Halos. The Librarian informed John of the Didact's plan to imprison humanity into digital form with the Composer. In doing so, she altered John-117's genes, an action that would prove itself useful when the Didact's forces raided Ivanoff Station. John-117 returned to a UNSC convoy led by Master Sergeant Marcus Stacker and eventually reached Requiem's gravity well generator. Using targeting data provided by the Spartan, Infinity destroyed the generator. "Do you truly believe these theatrics can prevent my departure? Embrace your sad fate and retain your nobility - I am already beyond you." Following the destruction of the gravity well generator, the Master Chief and Cortana began to push for Captain Del Rio and Infinity to assault the Didact's Cryptum and destroy it to keep the Didact from leaving Requiem. However, Del Rio refused to believe the two, calling their encounter with the Librarian "the hallucinations of an aging Spartan and his malfunctioning AI." This was furthered when Cortana's rampancy caused her to have an angry outburst. While Del Rio ordered Commander Lasky to remove Cortana's data chip to be destroyed, the Master Chief took it instead, telling Del Rio that if he wouldn't stop the Didact, the Master Chief would do it himself. The Master Chief refused Del Rio's orders to stand down and ordered Lasky to warn Earth of the coming threat from the Didact. Lasky was then ordered to prevent the Master Chief's departure by any means necessary but recognized that it was too dangerous to risk the Chief being wrong about the Didact. Instead, Lasky had a Pelican gunship prepared for full combat pursuit of the Master Chief but instead gave the dropship to the Spartan. The Master Chief departed Infinity in the Pelican as Infinity and her crew made their escape from Requiem. Without Infinity's firepower to back them up, Cortana suggests instead disrupting the communications at two of the towers near the Didact's Cryptum which would allow her to forge an override code and lower the Didact's shields so they could reach him. Using the Pelican's cannons, the Master Chief was able to destroy the Phantom dropships guarding each tower and make his way within. Inside each tower, the Master Chief fought his way through determined Covenant and Promethean defenders and used an EMP in one tower to destroy a carrier wave generator and destroyed the attenuators in another tower, giving Cortana the opportunity to lower the Didact's shields. All through this, the Didact telepathically taunted the Master Chief about the futility of his actions. With the Didact's shields down, Cortana suggested another course of action: reach the tower that controlled the spires surrounding the Didact's Cryptum and use the controls to encase the Cryptum in the towers and keep it from leaving Requiem. The Master Chief returned to his Pelican gunship and used it to reach the third tower, encountering no further aerial resistance along the way. Inside the tower, the Master Chief came up against a massive Covenant force defending both levels of the tower including two Hunters and several Shade turrets and Banshees. The Master Chief was eventually able to reach the control panel where he inserted Cortana who took control of the tower system. Cortana initially moved the towers to imprison the Didact's Cryptum, but her rampancy got the best of her and instead she dropped the towers. Unable to imprison the Didact any longer, the Master Chief decided to move across some nearby Liches heading for the Cryptum to reach the Didact. However, after he landed on the first Lich, the Cryptum merged with the Forerunner ship Mantle's Approach and joined a fleet heading out into space. Unable to stop the Didact from leaving, the Master Chief hitched a ride on the Lich as it followed the Didact's ship into slipspace. The Didact would arrive at Ivanoff Station and despite the efforts of the UNSC, he obtained the Composer and digitized everyone on the station excluding John-117, who was saved thanks to genetic augmentations provided by the Librarian. The Didact then set course for Earth, with the intent of digitizing its population, but was ultimately stopped and defeated by John-117. With the Infinity and the Master Chief gone, Requiem remained under Promethean and Covenant control. The UNSCDF would not return to Requiem until six months later, when the Infinity was again deployed to the shield world to establish research bases and obtain useful Forerunner technologies. Captain Del Rio was relieved of duty by the UNSC Security Council due to his decision to leave the Master Chief on Requiem, and Commander Lasky was promoted to captain of the Infinity. Covenant vessels intercepting the UNSC Forward Unto Dawn's wreckage in Halo 4. The Covenant boarding the Forward Unto Dawn. John-117 fighting Promethean constructs inside Requiem. John encountering the Ur-Didact for the first time. The UNSC Infinity is pulled inside Requiem. Covenant forces converge towards Infinity's crash site. The Chief leads the Spartan-IVs to retake the crash site. UNSC forces on a mission to destroy Requiem's gravity well. John and Cortana stay on Requiem to stop the Didact. The Didact eventually escapes aboard Mantle's Approach. John-117 encounters the Didact in Halo Mythos. ↑ Halo 4, Prologue Terminal "Jul 'Mdama"